Clinique - Deep Comfort Body Butter: It's perfect for dry winter skin. it has a thick consitency but yet when applied, it feel like the butter is marrying my skin. This product is similar to the body shop shea butter just the difference is the pricing. So if I do have many to spurlge then I would buy, otherwise the body show does a justice for me as well. Jergens Overnight Repair: This product is a hit for me. I was looking for a good moisturizer at my drugstore that was well-priced and that smelled fairly neutral. It has a nice clean, yet light smell perhaps from the evening primrose extract. I just love it and would surelu re-purchanse. Versace Women Perfume by Versace: It has a modern light floral with fruity smell. It's a good smell but the sad part is, it doesn't last long on me. So I wouldn't buy it again. 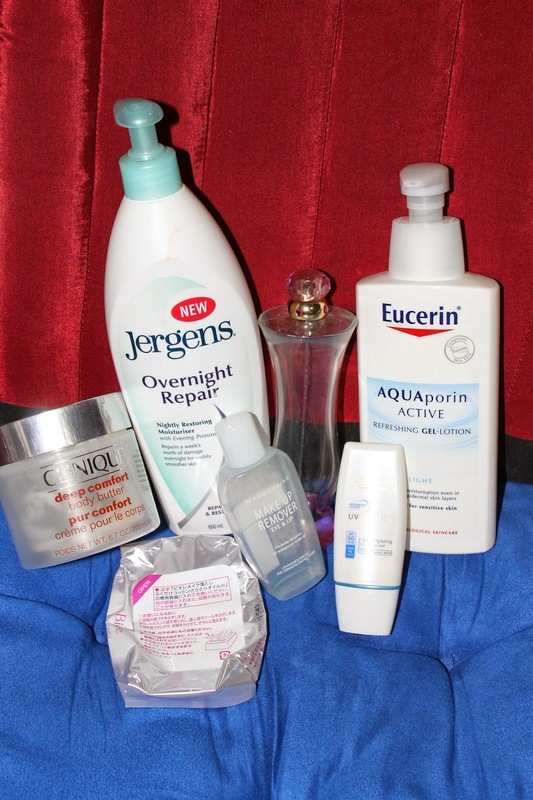 Eucerin AQUAporin Active Gel Lotion: I have a love hate with this product. It's a light textured, totally non-greasy lotion with a slight nuetral smell. It moisturise so well for my dry skin. But sometimes I feel if I apply less it wouldn't work, so I get frickle minded if it works or not. So I will give this cream another change and buy it again. Maybelline Eye & Lip Make up remover: This product is an average product. I purchange this over again and again because of its size. it is easy to carry around and it's sleek. As for the product it does an average work. Biore cleansing oil facial sheet: I love this stuff. I have been re-purching it for many times and will re-purchase it again. LÓreal Paris Dermo Expertise UV Perfect Tranparent Skin: This is my second bottle of it. I am on my third one now. So need not say how much I love it.